IN A SPAN of less than three weeks, two Palestinians used bulldozers in rampages against cars and people in Jerusalem. In the first incident, Hussam Duwiyat killed two men and a woman, and injured many, after he rammed a bulldozer into a packed commuter bus on Jaffe Street on July 2. According to reports, Duwiyat was a resident of Arab East Jerusalem and worked at a building site near the scene. His Jewish wifehas told the press that he suffers from drug-induced psychosis, but that he has no associations with nationalist or religious organizations. Against the background of the illegal Jewish settlement of Ramat Shlomo, an Israeli army bulldozer demolishes a Palestinian home in the Arab East Jerusalem neighborhood of Beit Hanina, July 15, 2008 (AFP photo/Ahmad Gharabli). In the second incident, Ghassan Abu Teir, 23, from the Jerusalem village Umm Touba, went on a rampage in central Jerusalem on July 22 near the King David Hotel, where Sen. Barack Obama was staying during his “election campaign” trip to Israel. Obama’s statement before the annual conference of the American Israel Public Affairs Committee (AIPAC) calling for a united Jerusalem has angered Palestinians, especially Jerusalemites. Nevertheless, Abu Teir’s family reports that the incident was an accident, that he lost control of the brakes and was shot only because of the previous bulldozer attack. No matter how startling, these recent acts pale in comparison to what Israel has done with its bulldozers. Bulldozers also represent the hundreds of Palestinian villages levelled and thousands of homes demolished in Gaza, the West Bank and Jerusalem in Israel’s relentless violation of international law. In 2004 alone Israel flattened 2,243 houses in Gaza and the West Bank, leaving some 14,000 Palestinians homeless. Bulldozing Palestinian homes under the pretext that the owners lacked building permits is common practice in Jerusalem. Bulldozers also have created massive destruction in the path of Israel’s Separation Wall snaking across occupied Palestine. Their Israeli operators have used them to uproot hundreds of thousands of olive, citrus and other fruit trees, representing the livelihood of Palestinian farmers; destroy hundreds of wells and agricultural storehouses; and tear up roads and block thousands of others with concrete and earthen mounds. Palestinians also remember the Israeli truck driver who killed four Palestinian workers in the Gaza Strip in December 1987. That accident—which to this day Palestinians are convinced was intentional—sparked the first intifada. In a shocking account published in the May 31, 2001 edition of Yediot Aharonot, Moshe Nissim, who had been suspended from his job as a senior inspector in the Jerusalem municipality on suspicion of having accepted bribes from contractors and other business owners, recounted his role in the attack on the Jenin refugee camp. Drunk and shirtless, he drove a massive D-9 army bulldozer on an officially sanctioned rampage. “For 75 hours, with no break, I just erased and erased, I kept drinking whisky to fight off fatigue. Over the loudspeaker, they were told to leave their houses before I destroyed them. But I did not give a chance to anyone. I did not wait. I did not touch the house and wait for them to come out. I would simply give the house a massive blow so that it would collapse as quickly as possible in order to get to other houses. To do a lot. A year later, in March 2003, 23-year-old American peace activist Rachel Corrie was crushed to death by an American-made Caterpillar bulldozer as she tried to prevent the Israeli army from destroying the Gaza Strip home of Palestinian pharmacist Samir Nasrallah. International activists who accompanied her claim that the Israeli soldier driving the bulldozer deliberately ran over Corrie twice, advancing and reversing, as she stood unarmed in front of the home. “Bulldozer” is also the nickname Israel’s belligerent former Prime Minister Ariel Sharon, who left 20,000 deaths in his 1982 march to and siege of Beirut. An Israeli commission of inquiry found then-Defense Minister Sharon indirectly responsibe for the massacre at Beirut’s Sabra and Shatila refugee camps. A decade earlier, as head of the IDF Southern Command, Sharon ordered the bulldozing of hundreds of Palestinian homes in order to carve a wide, straight path for Israeli troops and their heavy armored vehicles to move easily through Gaza’s Beach refugee camp. After throwing everyone’s belongings into the street, Sharon’s troops brought in their bulldozers and began flattening the street, beating and killing anyone who dared protest. That street is now known as Wreckage Street. In August 1971 alone, soldiers under Sharon’s command destroyed some 2,000 homes in the Gaza Strip, uprooting 16,000 people for the second time in their lives. 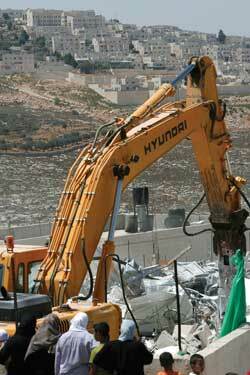 Every day, destruction by Israeli-operated bulldozers goes unheeded and unprotested. Only when the driver is a Palestinian or the victim a Jew is it condemned as an act of terrorism. Samah Jabr is a psychiatrist practicing in the West Bank and her native Jerusalem. LEBANON -- WHAT IF IT FELL?